Storms have again battered many parts of the UK this week, including the North west of England. One person was killed in Staffordshire. Here in Manchester there were no power cuts, but in northern Lancashire, many homes lost their electricity supply for a few hours. Lamp posts on the M62 near Royton were made unsafe by the wind and police had to cordon off the motorway, causing long traffic jams. At Ringway Airport, a Spanish airliner aborted its landing due to the strong winds and returned to Barcelona. Other planes were diverted. It's cool and calm outside now, though another low pressure system is set to bring more unsettled weather, but not as bad as yesterday's. A sixteen year old girl, who was shot in Argyll Avenue, Longsight in the early hours of Saturday morning has undergone an operation at Manchester Royal Infirmary to remove a bullet from her brain. Davinia Smith was gunned down as she was getting out of a taxi after an evening celebrating her sixteenth birthday. Two other girls, aged fourteen, were unhurt. The police think she was mistaken for someone else in a gangland feud, and are concerned because the public appear reluctant to come forward with information. Stephen and Lisa Hollingworth, from Clayton underwent an ordeal on Saturday when their two children, Harry and Holly, aged two and three, went missing after the car they were sitting in was stolen. Their father had left the engine running while he went into a newsagents in Audenshaw to buy a Lottery ticket. When he came out again, the car - and his two children - were gone. The Ford Orion was found in a street in Denton several hours later, with the children safe and well inside. The police are still hunting the person or persons who stole the car. Jim Shaw, the coach driver involved in last July's crash in the French Alps, has been found guilty of manslaughter and of failing to control his vehicle. The court in Albertville, France gave him a fine of 12000 francs, or £1250. If all this news sounds depressing, think of all the lonely, depressed and suicidal people who made 44,000 calls to the Samaritans in Manchester over the Christmas and New Year period. It was the "best" year ever - the Samaritans continue to receive more and more calls, but does this mean the population is getting more and more depressed? The figures for drunk driving haven't all been published yet, but it is reported that in Greater Manchester during the holiday season, there were ten per cent fewer arrests following breath tests than last year. Police still think that the figure of 324 arrests in Greater Manchester is too high. The Government is considering lowering the UK legal limit from 80 to 50mg of alcohol per litre of blood. Fear of the breathalyser obviously wasn't a major concern for 27 year old Brian Hart, who was found to be four times over the limit while driving a 38 tonne articulated lorry on the M61 last Tuesday. He was swerving from lane to lane and was stopped by police, who checked and found that he had already been banned from driving until 2002. Somehow he had managed to get a driving job. Bolton magistrates remanded him in custody, and the case will be dealt with by the Crown Court. Manchester University are preparing to celebrate the 50th anniversary of the computer. Later this year they will switch on a replica of "Baby", built in 1948. The machine weighed one ton, was sixteen feet long and had a memory of 1024 bytes (1K). The University is going to hold a competition: Applicants have to write a primitive piece of software for "Baby". Is there anyone out there who can help? The weather, as stated above is calm, and the temperature, as ever is hovering around 5 degrees celsius, 40 degrees fahrenheit. As they say on Crimewatch "Don't have nightmares" - despite the disturbing news, it looks like it's going to be a great year in Manchester in 1998 - so keep reading this page for a concise update of what's happening, with lots of photographs, new and old. Last week's pub was the Boar's Head, in Middleton. Thanks to Sean McSorley, ex Victoria Avenue East resident. This week's ale house is a famous landmark on the A6 from Manchester to Stockport, in fact it's equidistant from both places. That's a clue to its FORMER name, but since then it has succumbed to "Paddyisation" and now has a new name. Either name will do, though I know which one I prefer. Answers by e-mail please! As a reader of the Eyewitness in Manchester for some months now, I just thought I'd drop you a note of thanks at this, the beginning of the new year, and wish you all the very best for it Aidan. My wife Doris is from Bolton, I was born in Ashton under Lyne (though confession time: I lived most of my early life in Wythensahwe before going to sea at the age of 21) and we have now both lived the greater part of our lives in New Zealand. We still have a yen for home though and greatly appreciate both the current and past editions of the Eyewitness. Love the site! It's my favourite, and your pics bring back lots of happy memories. A Happy New Year to you Aidan and all fellow expat Mancunians. Let us all hope you can keep up the good work in 1998. I was one of the Manchester Mods who used to frequent the many clubs in the mid sixties, the Twisted Wheel, Brazennose street and Whitworth Street sites also the Jungfrau (behind the Cathedral), the Jigsaw, the opening night featured the Who, bad mistake, and the Oasis. Can you tell me if there are ever any reunions for the Manchester Mods of this era? I know that there are such regular reunions for the Blue Moon in Cheltenham who used to get the same bands as us. i.e The Steam Packet etc. I posted a notice in "Looking for" for anyone who remembers the times well and I had quite a few replies from expats in the states and Australia who would be interested in such a get together. I am now living in the South of England but keep in touch with Manchester and also visit there frequently. However, I cannot find the old Whitworth st site of the TW. Can anyone help!!!! Manchester Eyewitness 1948 is temporarily suspended, as the microfilm for January to March is missing from the Central Library. 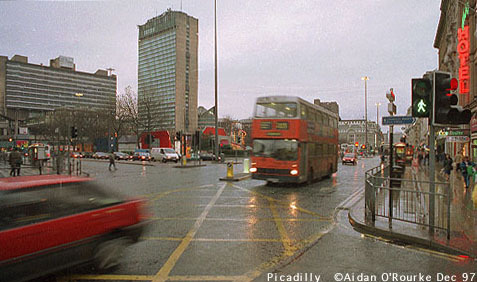 Instead, I've made a new feature, entitled "Flashback", in which we flash back to one day in Manchester in the past. I hope to include a picture each week. Please let me know of a date you'd like me to flash back to - your birthday perhaps - and I'll see if I can dig it out - microfilm permitting. Forty years ago this week, on the 4th of January 1958, there were bad storms, as today. Read about it in this week's "Flashback".